This week: Scout goes for a swim, Sketch Card winners, and Fan Art for Halloween! Watching Scout try and fail to get some grub is making me hungry. I may have to throw him a bone soon. Or make myself a sandwich. Remember, it’s been weeks for us, but he’s only been wandering around for a few hours or so. Don’t worry. I’m not going to starve the dog. Ok, Sketch Cards. Congratulations to Krishna who won the Scout sketch card! He’s already received it and he loves it. And another congratulations to Frank who won the Bigfoot Halloween Sketch Card. It’ll be on its way soon! First, I participated in Denver Brubaker’s Checkered Man Trick-or Treat Fan-Art promotion. Denver had a bunch of webcomic artists dress their characters as his Checkered Man. It was a lot of fun to do, and I discovered a lot of other talented artists and fantastic webcomics just flipping through the submissions. If you’ve never read The Checkered Man, take a look around when you get there. Next, I swapped some fan art with Jeff Crowther, creator of Yeti 4 Hire. I worked in a hybrid style that combines a little of Jeff’s aesthetic with mine. I think it looks pretty good! And so does Jeff, so nyeh! You can see the full piece by scrolling down below today’s Yeti 4 Hire! 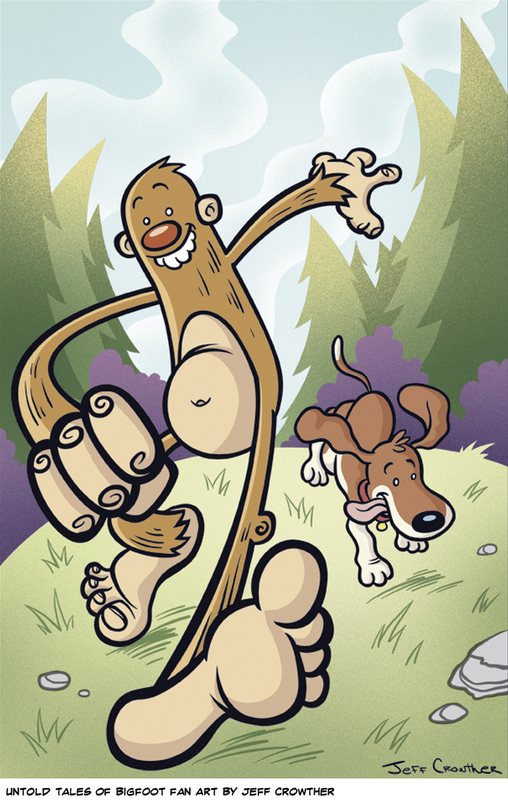 Finally, scroll down to see Jeff Crowther’s awesome Untold Tales of Bigfoot fan art. Jeff’s a busy guy (he updates Yeti 4 Hire a few times a week) but he still took time to crank out this amazing Bigfoot piece for me. Jeff’s action-packed, all-ages webcomic, Yeti 4 Hire is a lot of fun and the bold colors and sweeping style are bursting with energy. You get a sense of that with this hilarious Bigfoot and Scout piece. You should definitely check out Yeti 4 Hire (immediately after reading, liking and sharing this Bigfoot post, of course) and tell Jeff how awesome he is.